The Samuel and Jean Frankel Cardiovascular Center is one of the largest facilities in the heart of the University of Michigan Medical Campus. It is in this 350,000 square-foot, multidisciplinary facility that we can fulfill our vision of being the best academic heart and vascular center in the world. The facility, which opened June 11, 2007, includes a 24-bed surgical post-procedure ICU, 24 vascular general/moderate care beds, nine cardiac procedure rooms, four cardiac surgery operating rooms, two vascular surgery operating rooms, two general thoracic operating rooms, two endovascular procedure labs and 36 clinic exam rooms. In addition, a 2013 gift of $7.5 million to the University of Michigan supported creation of a new hybrid operating suite, which opened in 2017. Twice the size of a regular operating room, the 1,200-square-foot hybrid suite represents collaborative space where multispecialty procedures can be performed by cardiologists, cardiothoracic surgeons, vascular surgeons and interventional radiologists. 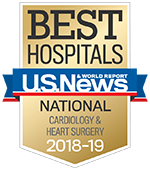 From outpatient visits and tests to surgery and recovery, the Frankel Cardiovascular Center serves as a central location for coordinated, top-quality cardiovascular care from our highly skilled medical and surgical teams. Together with inpatient units in University Hospital, outpatient clinics located throughout the local area, and specialized care for children with congenital heart defects at C.S. Mott Children's Hospital, the building makes U-M's nationally recognized cardiovascular care convenient and accessible to all. The Frankel Cardiovascular Center is designed to create a calm and healing environment for patients and visitors. Indoor and outdoor healing gardens, rooms for quiet reflection, a patient education center, valet parking, a heart-healthy café and art-filled halls are just some of the features geared toward patients and families. For more information about the various features of the Frankel Cardiovascular Center, visit our Tour page.